Be the first to share your favorite memory, photo or story of Adair. This memorial page is dedicated for family, friends and future generations to celebrate the life of their loved one. 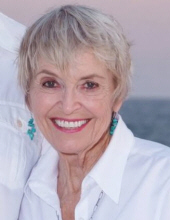 On Sunday, April 7, 2019, Mary Adair Dougherty McCook (she’d never speak to you again if you called her Mary) – Jay’s incredible wife of 54 years, the greatest mom to Allison, Farrell, Adam and Erin, and coolest Grandma ever – passed at 81. Adair was born January 4, 1938 in Mesa, AZ, developing a love for turquoise jewelry and serving the best Mexican food you’ve ever eaten. Early during their marriage, she enjoyed gourmet cooking while camping across the desert, later becoming a self-taught master of French cuisine from Julia Childs’ cookbooks. Adair performed various administrative roles, retiring from Aviagen in Huntsville. Moving kids, cats and antique cars became the norm as Jay’s auto industry career relocated them from Chicago to Minnesota, Galveston to Georgia, and finally settled in Alabama. She loved animals, Diet Dr Pepper, and laughing out loud. She was a pro at Jeopardy, beautiful gardens, needlepoint, and collecting McCoy pottery. She devoured libraries-full of books and made stunning jewelry gifts for everyone she loved. She and Jay are members of St Paul Catholic Church in Athens, where they’ve lived for more than 30 years. We miss her so, but know that God, Gramma Pearl and all our friends and family who’ve gone before us are in Heaven to greet her with open arms. To send flowers or a remembrance gift to the family of Adair McCook, please visit our Tribute Store. "Email Address" would like to share the life celebration of Adair McCook. Click on the "link" to go to share a favorite memory or leave a condolence message for the family.